E-grit is a product made by Rominex and obtained in the process of processing glass cullet. E-grit is customer-specific glass beads for surface cleaning. The irregularity of grains produced by the crushing process gives our product exceptional properties for cleaning of all kinds of materials, such as precious metals, wood, brick, concrete and many others. Rominex has been operating on the Polish market since 1994, dealing mainly with transforming glass cullet into glass shavings and glass grit. To meet the needs of our customers, we have adapted the machines and equipment to ensure that the product fraction they purchase meets the requirements of effectiveness and efficiency of cleaning individual materials. 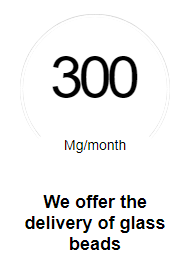 We have our own transport and a constant supply of raw material for the production, allowing us to ensure timely delivery in the amount of 300 Mg/month. Processing of stainless steel, precious metals and light metal alloys, easily contaminated by iron. Preparation of surface for further anti-corrosion treatment, replacing the need for chemicals. Matting of stainless steel, chrome, technical and economic glass. Adorning or cleaning materials, such as light metals, plastics, wood, glass, brick, concrete. Used in process of manufacturing artificial Christmas trees and Christmas decorations. Cleaning corroded car body parts. Removing graffiti from concrete and plaster surfaces (very good results). Renovation of façades of buildings, walls (also clinker) and other objects. Decorative matting of porcelain surfaces (high reproducibility of obtained effects). Cleaning of precision, soft and brittle products. Glass matting (high reproducibility of obtained effects). Production of non-refractive and electrotechnical ceramics. Renovation of ship hulls, preparation of surfaces for painting. Mold processing, medical tool processing.